I like your blog name and reasoning. 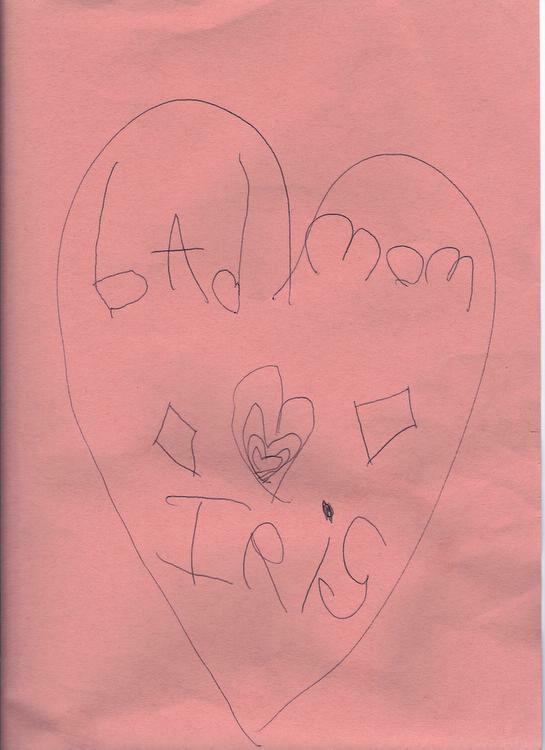 However, I think your daughter was trying to write "dad" "mom" and "Iris" in the heart. She wrote the "d" backwards. Interesting theory. I will have to ask her to explain her intention when she created the drawing. Whatever her original intent, I can assure you that she gives me plenty of feedback on my job performance. At night, she tells me if I was a good mom or bad mom that day. Her father also gets job performance critique. Notice his blog is called Bad Dad. Oh my gosh. Your blog name is the story of my life? Just kidding. I love your musings and just found your blog. I'll be coming to visit more often.